If you’re looking for a stainless steel watch with a bold design that will get you noticed look no further than the Men’s Reserve Chronograph Blue Dial Stainless Steel Chronograph Watch 6897. 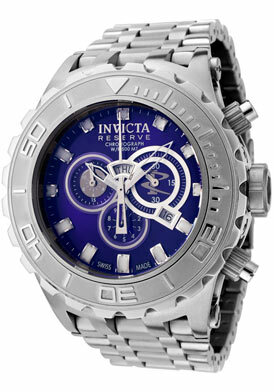 The brushed silver-toned stainless steel gives off a bold masculine design and captures the eye. A luminous blue dial sports 60-second, 30-minute, 12-hour, and 1/10th-of-a-second subdials, as well as silver-toned hands and hour markers. It is water resistance up to 500 meters making it perfect for the boardroom or relaxing by the pool. 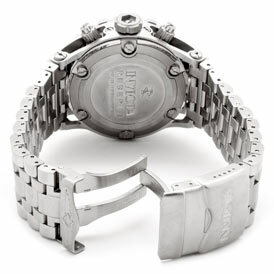 The fold-over safety clasp makes it easy to take on and off as well stay secured under water. All this and precise Swiss-quartz movement make it an elegant addition to any man’s outfit. The round-blue watch face provides a clear contrast with the sliver hands creating an easy to read watch. This will come in handy in a dark restaurant during a romantic evening. The sheer elegance of the brushed stainless steel is sure to impress any date. The flame-fusion crystal provides exceptional protection against nicks and scratches ensuring The Men’s Reserve Chronograph Blue Dial Stainless Steel Chronograph Watch will still look new long after the purchase date. 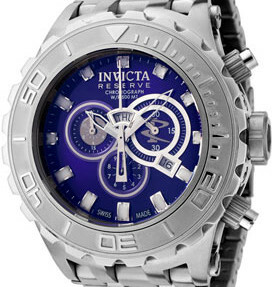 Invicta Reserve collection has a reputation for exceptional taste and a timeless feel. The Swiss made watches are exclusively hand-made and represent a pinnacle in superiority for the discerning aficionado. All watches are produced in a limited quality making them the ideal watch for the serious collector. The elegant design gives it classic feel. If you’re looking for a more modern look this isn’t the watch for you, but if you are looking to class it up a bit The Men’s Reserve Chronograph Blue Dial Stainless Steel Chronograph Watch is exactly the accessory that will do it. Although the listed retail price is $2,900 you don’t have to break the bank for this posh watch. With a little shopping around online it can be found for as low as $575.00. For added convenience, this watch arrives in a bright yellow Invicta box for easy storage and gift-giving.